The leaders of the world’s largest economies are about to gather in China for the annual G20 meeting . 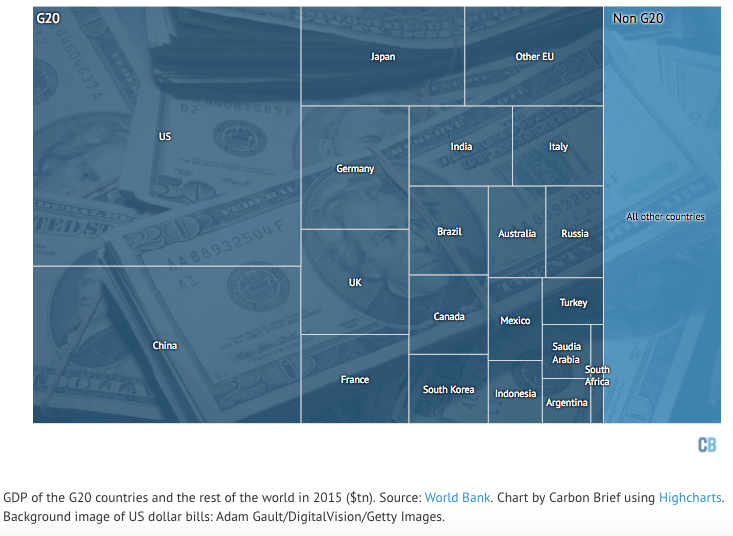 These countries are richer than average and they emit the vast majority of the world’s CO2 emissions. That’s because they use the most coal, oil and gas – even though they host larger capacities of low-carbon electricity generation than the rest of the world combined. The G20 is made up of the Argentina, Australia, Brazil, Canada, China, France, Germany, India, Indonesia, Italy, Japan, Mexico, Russia, South Africa, South Korea, Turkey, the UK and the US. The EU is also a member. 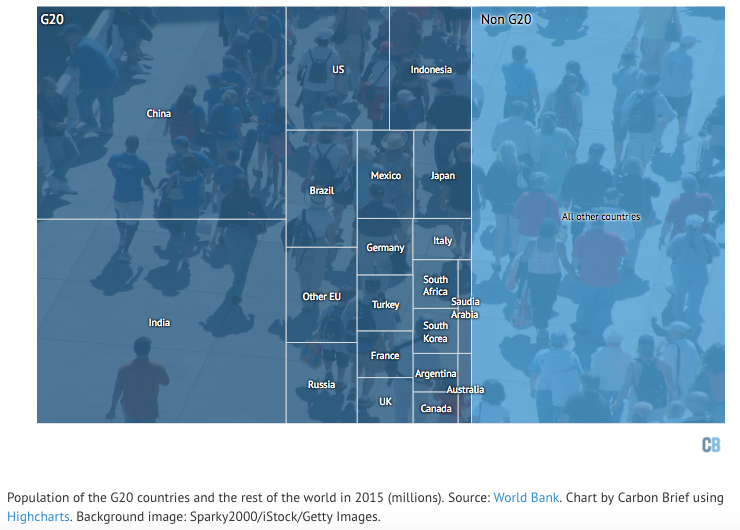 Even though it includes China and India, the world’s two most populous nations, the G20’s combined population of 4.6bn makes up just 63% of the global total of 7.3bn. On the other hand, the G20 nations account for some 82% of global GDP. The US in particular claims a disproportionately large 24% share of global GDP, considering its 4% share of population. It isn’t only GDP where the G20 nations have an outsized influence. They also emit much more CO2 per capita than the rest of the world. China accounts for 27% of global energy-related CO2 emissions, with the US in second place with 16%. Note that there is a wide variation in per capita emissions within the G20, ranging from India’s 1.7tCO2 up to 17.1tCO2 in the US. China is now on a par with the UK, at 6.7tCO2 per person. 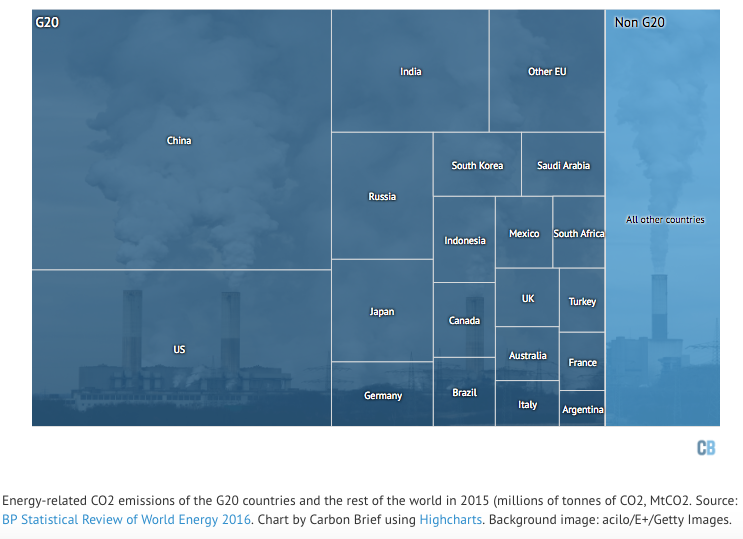 The G20 nations emit a lot of CO2 because they burn more fossil fuels than the rest of the world. For example, China uses half of all the coal burned each year. China’s coal demand has now been falling for a couple of years, with the result that global coal use is also in decline. 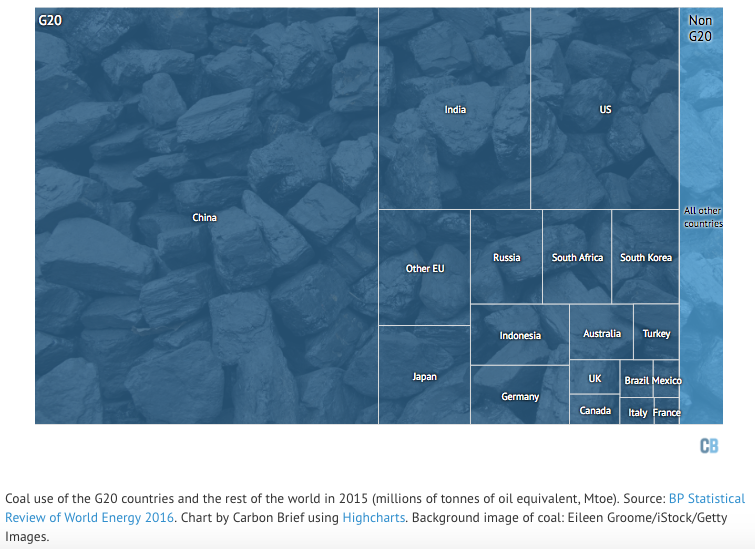 Even though Argentina and Saudi Arabia use negligible amounts of coal, the G20 accounts for 93% of the world’s coal use. 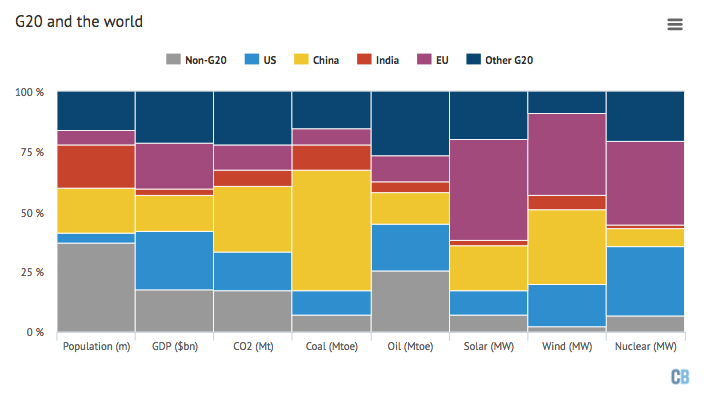 It’s also interesting to note that India, which is sometimes expected to dominate future coal demand growth, only burns around a fifth of the amount used in China. 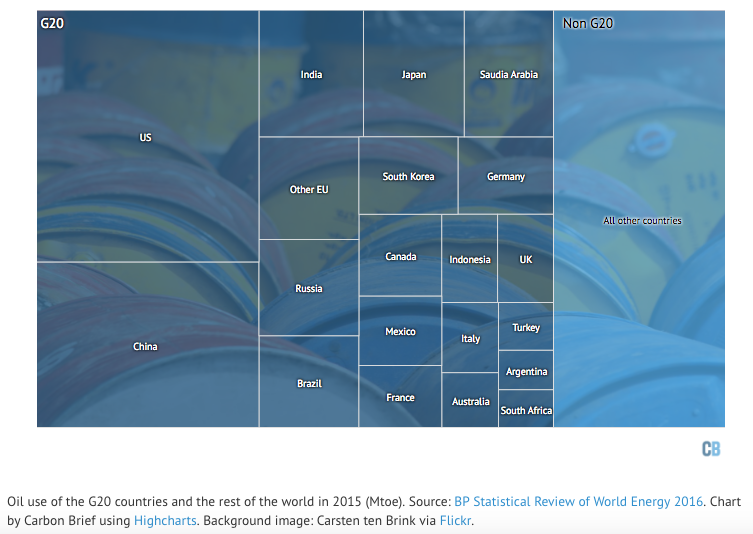 The G20 is responsible for three-quarters of global oil use. The US accounts for 20% of demand on its own, well ahead of second-placed China, which uses 13%. It’s worth remembering, then, that the US population is just 4% of the global total. The G20’s appetite for fossil fuels remains sizeable, despite its dominance when it comes to low-carbon sources of energy. In solar power, for example, the G20 account for 93% of global capacity. China recently overtook Germany to become the number one nation for solar capacity, its 43 gigawatts (GW) accounting for 19% of the global total. A rather small number of countries dominate the solar scene. 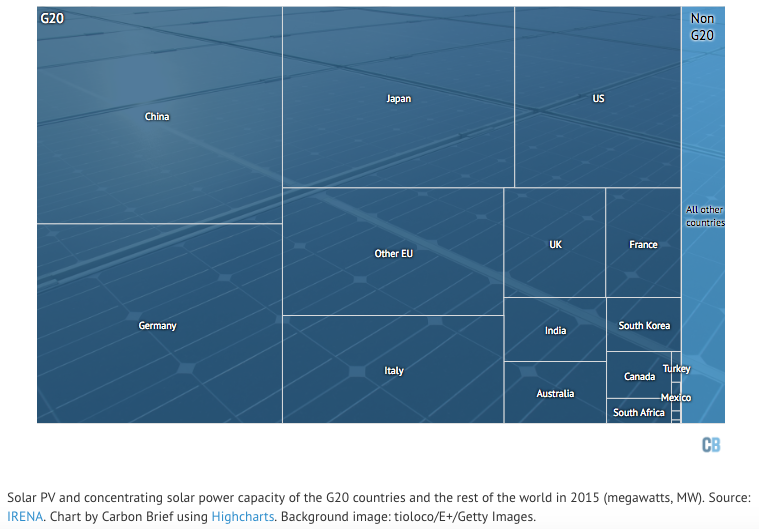 China, Japan, the US and the EU alone host 85% of the world’s solar panels. However, this picture could begin to change as states including India have ambitious targets for new capacity. 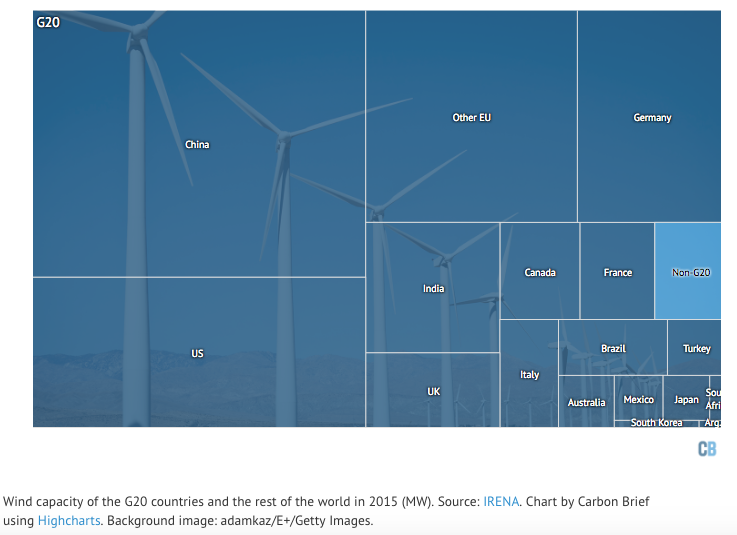 G20 dominance is even more extreme when it comes to wind, where just 2% of capacity in 2015 was in non-member countries. Within the G20, there are some surprises, with India well ahead of the UK and France. Note that wind capacity is not the same as wind power generation, which depends on the capacity factor of the turbines. For example, while China easily exceeds US wind capacity, the positions are reversed in terms of electricity generation. 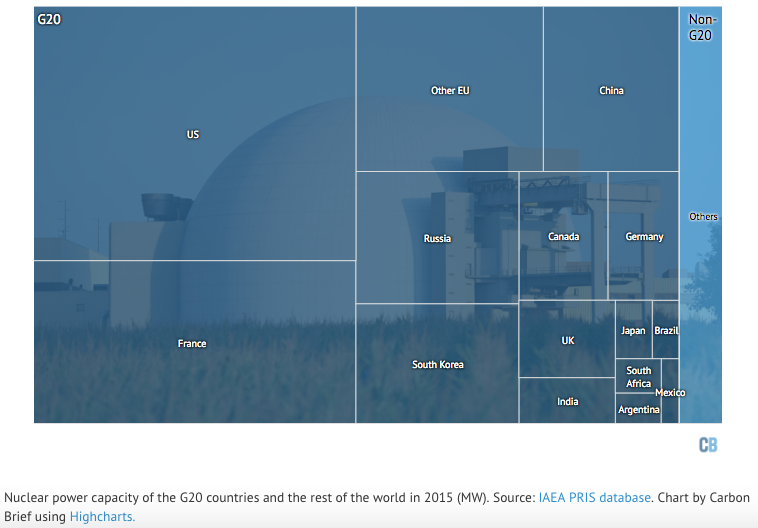 Finally, the G20 also runs 97% of the world’s nuclear power capacity, with the US (29%) and France (18%) accounting for nearly half the global total . This is despite the fact that some G20 nations, notably Italy and Germany, have, or are in the process of phasing out nuclear power. Note that while Japan has a large nuclear capacity, most of its reactors have sat idle since the 2011 Fukushima disaster. The chart below includes nuclear reactors that were operating earlier in 2016 , based on data from the International Atomic Energy Agency (IAEA). The data above is summarised into a single chart, below, showing the dominance of the G20 across global wealth, emissions and energy. The G20 meeting is one of the series of international political set pieces that punctuate the calendar. It is the largest such gathering since the Paris Agreement was inked last December. Climate change may not be top of the G20 agenda. The Syrian civil war and other more mundane international issues, such as the UK’s decision to leave the EU, are likely to take higher billing. Nonetheless, as the charts above show, the decisions the G20 countries make, as well as any they avoid, will be hugely significant for the global response to climate change.